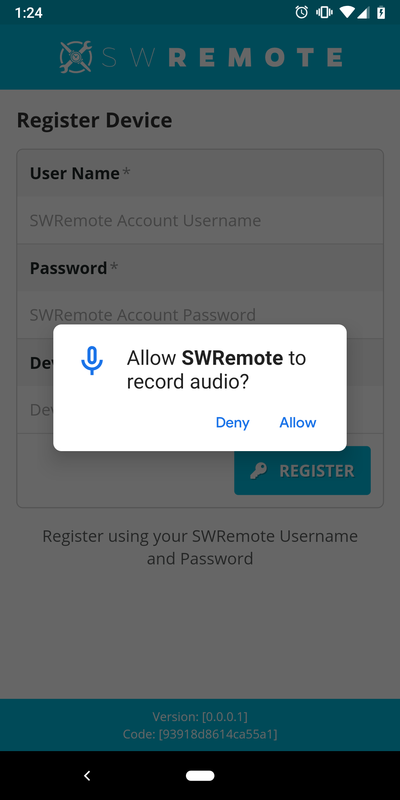 What does the "Allow SWRemote to record audio" message mean? This is asking you if the Android Operating System can use the Audio Jack when trying to process a Credit Card Payment when a Swiper is plugged in. You need to press "Allow" in order to have permission to use a Swiper, seeing as the Swiper uses the audio jack to transfer the credit cards information. If you press the Deny button, you will not be able to use the card reader. This indicates that you cannot process credit cards using the Audio Jack/Swiper. You will need to try again or go into the settings of the device to re-enable the Audio.